Monkfish isn’t known for being the prettiest of fish, with its mottled skin, huge flat head and gaping mouth filled with menacing teeth. However the flavour is sweet and mild and the flesh is firm and almost 'meaty' in texture making it a popular choice on menus. Monkfish is usually sold in tails, fillets (steaks) or cheeks. It usually comes skinned and filleted with the pinkish membrane stripped away; if this hasn’t been removed, pull it off before cooking or it will shrink around the fillet making it twist. As with all fish it is important to choose the freshest fish before buying - it should be firm to the touch and free of an unpleasant fishy odour. 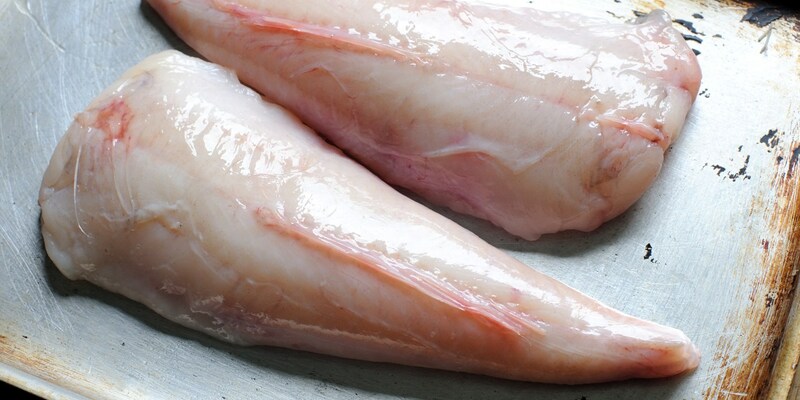 When choosing fillets of monkfish, look for pearly white flesh with no discolouration. Monkfish can excrete a milky-looking fluid when cooked; this is fine if it’s being cooked in liquid but not so great on the grill. Salting the flesh or soaking it in brine for an hour then patting it dry before cooking will help. To establish whether monkfish is cooked, insert a sharp knife into the thickest part of the flesh – if it’s cooked through the knife will come out hot to the touch; the flesh should also feel springy. Whether cooking monkfish tail or fillet make sure that you rest the cooked fish for about 5 minutes before serving. Monkfish fillets can be pan-fried or roasted to give the fillets colour. An average-sized monkfish fillet (around 100g) will take around 5–6 minutes. Monkfish suits being grilled or barbecued because the robust flesh doesn’t fall apart easily. It can be cubed and skewered to make kebabs. Marinating it first is a good idea, because monkfish soaks up flavours well. Meaty monkfish can support big flavours which is why Marcus Eaves laces his recipe with black curry powder and Josh Eggleton concocts a Vindaloo spice mix in his monkfish recipe. Tom Aikens uses monkfish in his Fish pie recipe as well as his brilliant Bouillabaisse. Shaun Hill rests monkfish atop a bed of tomato sauce in his Monkfish recipe with tomato, ginger and garlic while Alfred Prasad envelopes the fish in a spicy tomato sauce in his sumptuous Monkfish curry. The saltiness of cured meat is also a common flavour pairing with monkfish. For inspiration, see Marcus Wareing's monkfish with chorizo crust, or Chris Horridge's monkfish wrapped in parma ham.